I can’t believe Term 2 has almost finished! Our Tuesday night class has gone really well this term and it’s such a pleasure for me to see Beginner Patchworkers churning out some pretty impressive quilts after 10 weeks. With the constant arrival of new fabrics into the store, this week we have 4 more bookshelves to accommodate what is due to arrive in the next couple of months. With this in mind, I have put together some new classes and we will start our first ‘Block of the Month’ at the beginning of Term 3. We will trial one or 2 to start with and possibly tweak them as we go along. 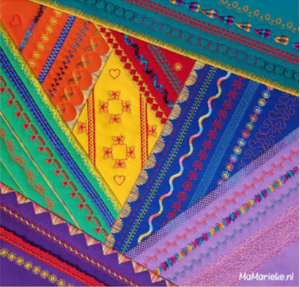 This is a project specially designed to use the decorative stitches on your sewing machine. 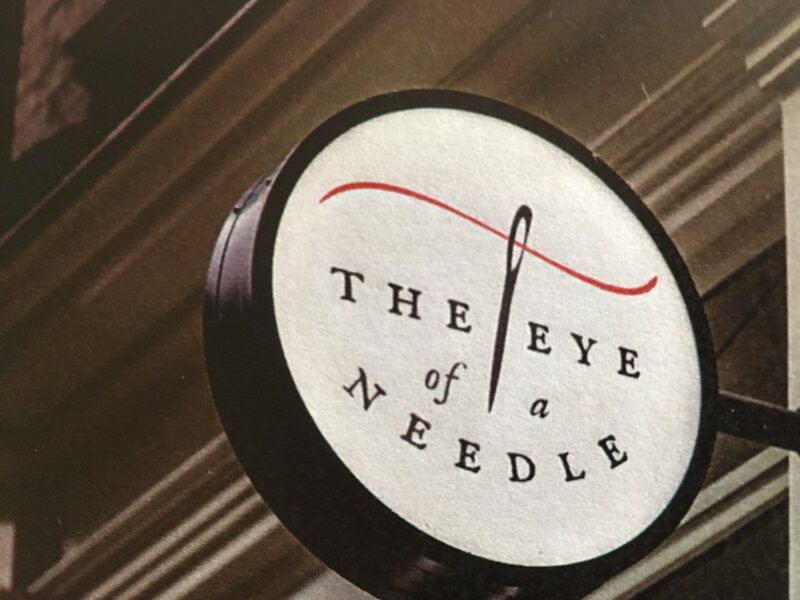 It doesn’t matter what machine you own: every machine has decorative stitches, even regular stitches like the straight stitch can be used to decorate. You will be working with machine quilting threads and other special (metallic) threads. 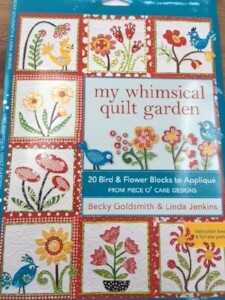 There will be opportunities to work with ribbons, trims, sequins, strings (couching) and freehand quilting with this project. The plan is to have fun using different stitches to create one block each month for 12 months. With each block you will learn a new technique.Classes will be held on the 4th Friday of each month, starting Friday 27th July. What you don’t complete in class, you can finish at home over the following month before you return to class for the next block. If you would like to sign up for this class the cost will be $120 plus your choice of fabrics and threads. There will also be an opportunity to do this BOM without attending the class every month, but you will need to sign up to receive your pattern and fabric on a month by month basis. This is a scrappy quilt where we will appliqué up to 20 Bird & Flower blocks over 12 months. 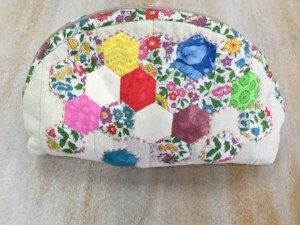 It is based on a pattern by Becky Goldsmith & Linda Jenkins from Piece O’ Cake Designs.The class will be held on the 1st Friday of each month, starting Friday 3rd August 10am -12:30pm. You choose your own background fabrics, and we will supply the appliqué pattern and fabrics required for each block for 12 months. We will make 12 blocks over this time, but there is flexibility to make up to 20 blocks if you want to make a bigger quilt. If you want to do this class you will need to come in and choose your background fabrics before you start. Class fee $60 + kit + your choice of fabrics. This is a cute little zippered bag that is great for carrying around all sorts of things from makeup to sewing bits & bobs. This little bag would also make a great gift and can be made in one 4 hour class. You can add extra embellishments later if you want. There are 2 sizes to choose from. Cost $40. You will need to choose fabric + requirements for the class. Saturday 28th July and Saturday 18th August from 9:30am – 4:30pm. Jenny Borke has made lots of these gorgeous overnight bags for her grandchildren and has offered to teach this class over 2 Saturday’s. You can use a variety of different fabrics and add buttons and pockets to create totally unique bags for everyone in the family!This class will run on Saturday 28th July and Saturday 18th August from 9:30am – 4:30pm. You will need to plan and purchase your fabrics before the class. 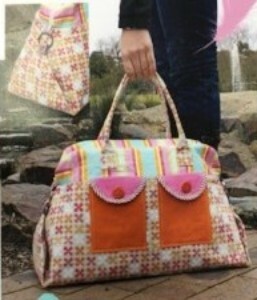 The fee will be $80 + the fabric and things you need to make this bag. We have a beautiful range of the latest French General Jardin de Versailles fabrics and a lovely collection of ‘Something Blue’ which is too nice to leave sitting on the shelf. I have decided to put together 2 sampler quilts using each of these fabrics as another Block of the Month project.You will make nine gorgeous blocks over 9 months using either the ‘French General’ OR the ‘Something Blue’ fabrics, but you will only pay $29 for the blocks. Here’s how it works: You pay your $29 to sign up. On the 3rd Friday of the month starting 17th August you come into the shop and pick up your first block with the pattern and fabric that you will need. During the next month, you make the block (or you can make it up in class that day). In the third week of September, you bring your completed block back into the shop. Once I’ve admired your lovely work I will give you the pattern and fabric for your next block. Sometime during the next month, you make that block (or make during the Friday class) and then you come back the third Friday in October and repeat the same process for eight more months. Over nine months you make nine 12″ blocks for only $29.00 total. 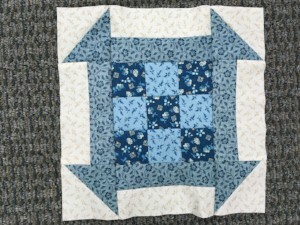 There are different blocks each month and this is suitable for all levels of patchwork experience. The only rule for this project is that you have to make the block and bring it in yourself each month. You can make up the blocks into a quilt at the end of the project and there will be an option to buy a finishing kit if you choose. Our Tuesday and Wednesday morning classes are going very well during the term, from 10am-12:30pm. We have a maximum class size of 8 and everyone is working on their own projects. If help is required there is always someone available to give advice. There are a couple of spaces left in these classes and also the opportunity to sew on a Tuesday night from 7pm – 9pm. Class fees are $50 for a 10-week term. If you like to sew with other ladies and want to be inspired and take time out to complete some of your sewing projects, one of these classes might be perfect for you. Steph has been coming up from Hastings every fortnight to do massages in our back room. They have been very well received and the majority of those who have experienced her massage have come out looking very relaxed. Steph will continue with massages every fortnight and will be back next on 17th/18th July. Come in and book your spot – $60 for one hour of bliss! The Taupo Quilt Makers Exhibition will be held at Taupo-nui-a-tia College this year from October 5th-7th. Doors will be open from 10am – 4pm. Mark your diaries now for this bi-annual event. There will be merchant sales tables and raffles during the exhibition. I hope you are all staying warm and well. If you think you could do with some extra warmth, pop in and see me to sign up for another quilt class. This time next year your blocks may have just been made into another very warm quilt!